I developed a sincere admiration for John McCain during his 2008 campaign to become President while running against Barack Obama. I did so because during a town hall meeting, an admirer of his said she could not trust Obama because Obama was an “Arab.” McCain unequivocally disagreed. McCain said to her that was not true. Obama, McCain said was a “decent family man” with whom he happened to have disagreement with on certain issues. Like a number of people I was stunned. McCain displayed real courage in front of his supporters who for the most part, wanted to believe Obama was an Arab. I thought it no small feat. Especially when we compare it to the type of racist vitriol we hear not just from President Trump but from so many in the Republican Party. A lot of it being said without sound. My respect for McCain grew over the years as I watched him defy party and colleagues by doing the right thing. 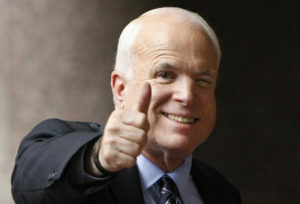 Who will ever forget his getting out of his hospital bed after surgery to cast the “no” vote on destroying Obamacare? That vote earned him the undying rage of President Trump and the far right wing of the Republican Party. McCain did not care. For him casting that “no” vote was the right thing to do and he did so. There is little question in my mind that much of the dislike Trump has for McCain is seeded in jealousy. Trump was jealous that McCain was an honorable man and he is not; jealous that McCain was a war hero and he was not. When it was Trump’s turn to serve his country in a war, he found a physician who said he could not serve because of “bone spurs.” He is jealous because McCain understood that good policy comes from good process and that process has to include input from both political parties. Perhaps McCain’s greatest legacy is just that: his ability to reach across the aisle. To see that people in politics really may have more in common that they do differences. Even with differences, McCain believed some middle ground could be gotten to. At least that was true before the era of Trump. Now politics is divide and divide some more. Republicans running for office are afraid not to follow Trump’s vision no matter how unsettling it is. They speak in the same modality he does. That modality is real Americans are preferably male, preferably white, and preferably rich. Yet for all of that divisive rhetoric, Trump holds great sway over a large number of Americans. From the very beginning of his Presidential campaign when he declared McCain was not a hero because he had been captured. All Americans should have risen up en mass and defended this man who spent 5 years in a cage as a prisoner of war. Even now as Trump receives deserved reprimand for not honoring McCain as he should, the Republican Party is silent for the most part. It is as if they believe that he can display no behavior too boorish, commit no act too immoral, or say anything too despicable. John McCain was not one of those who believed such a man was worthy of his company. Not John McCain. Not even at his funeral.